Do you remember the days of 2002? I remember smoking two packs a day, being afraid all the time and looking as skinny as a wet ferret while history surged around me faster than I could comprehend it. 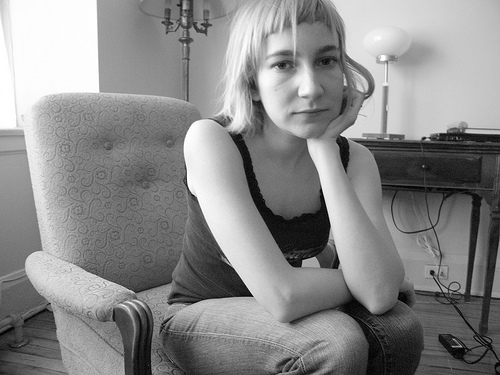 I also remember Toronto author Sheila Heti's first book, The Middle Stories. I remember how different it seemed from all other fiction. One of the earliest books to be published by McSweeney's, the short story collection is being re-released this month in a 10th anniversary edition. In the decade since her debut, Heti has gone on to collaborate with Misha Glouberman on the lecture series Trampoline Hall and the well-received experimental self-help book The Chairs Are Where the People Go as well as to publish her new novel, How Should A Person Be? with Henry Holt this June. Part essay and long-form Q&A with her real life friends, with lots of fiction, How Should a Person Be? resists the easy synopsis of most novels, but is in many ways more logical than a conventional narrative these days. It also points to a future where social media, reality culture and fiction aren't so separate. The Middle Stories, meanwhile, is still striking in its economy of language and still surreal in the original meaning of the term -- thought captured so acutely it becomes strange. I spoke with Heti recently about the new edition. Brian Joseph Davis: What was it like to look at The Middle Stories again during the reissue process? You've added nine more stories, did any come out? Sheila Heti: I remember going over proofs of this book -- my first book -- back in 2001, in a bar in Toronto called the Victory Cafe, and thinking sadly to myself, "This is a very good manuscript, but not a very good book." I don't know what I meant by that, but I was pretty heartbroken and sure it was true. I didn't have any special thoughts like that going over the proofs this time. I'm pretty used to the stories by now. They seem familiar and remote. The nine stories that were added were stories that were in the original Canadian edition, published by Anansi, which was published a year before the McSweeney's edition in the U.S. For the 2002 McSweeney's edition, those stories were taken out and a new one, "Madame Songe," was put in. The reason they were taken out had to do with 9/11, actually -- some sense that those stories were no longer appropriate. It was a funny time for those kinds of decisions. For the reissue, I took "Madame Songe" out. The choice of stories and the order of stories is exactly like what it was in the original Canadian edition, which makes me happy. BJD: Do you remember what worried you the most about first publishing The Middle Stories? SH: I was scared in a general sort of way, but not worried, because I wasn't familiar with all the things that could go wrong. I had no idea what to expect. Things did go wrong -- the major reviews in The Globe and Mail and The Toronto Star came out weeks before the books were in stores. But it was a good experience, in the sense that I had a lot of fun at the book launch, and the books themselves turned out to be such beautiful objects, which is all thanks to Bill Douglas, the designer, and Martha Sharpe, who was then publisher at Anansi, and approved the yellow silk ribbon which was woven into the spine. BJD: With ten years distance, do you see The Middle Stories as part of any era or history? SH: Not as a piece of writing, but certainly when I toured the book through the United States with the McSweeney's edition -- in a van with Carl Wilson (my then-new-now-ex-husband), and Misha Glouberman, and our friend Erin Oke -- we did feel part of some tide of interest. Tons of people helped us out, letting us sleep on their floors, and they attended our events in great numbers (we performed Trampoline Hall in ten cities) and that was all because of everyone's excitement about McSweeney's and anything having to do with it. It was still early enough Internet days that an audience could gather in a mass around a website like McSweeney's, rather than be splintered among so many good websites. BJD: You've covered an incredible writing distance between these stories and How Should a Person Be? What about your writing or concerns have stayed the same? SH: I just always try to respond to what I'm most interested in at the moment -- that hasn't changed. There's so much to learn in writing and in life, and in any particular era in one's life, it seems like a few concerns have to be dealt with at once, or else something really bad could happen. Writing seems like the place to deal with those concerns. BJD: What else from 2002 do you think we should look at, read, or watch again? SH: I would have to go to Wikipedia to answer this, and look up 2002. I don't have such a good memory of that year, or any year, in terms of cultural artifacts and when they appeared. Let me try to do this without Wikipedia... Susan Sontag's Regarding the Pain of Others? Matthew Barney's Cremaster videos? The first season of Survivor? I may be off by a few years.